With a name like Sniffen, it's got to smell good. 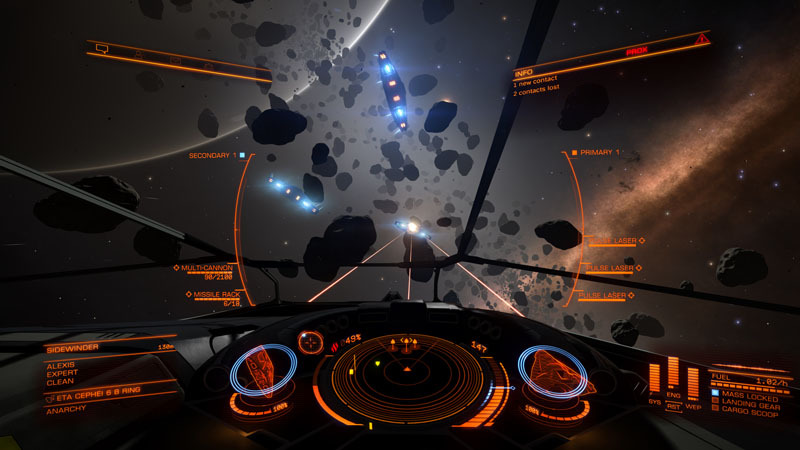 A review of "Elite: Dangerous"
Debra Doyle and James MacDonald, the authors of The Price of the Stars, once wrote in the preface to The Stars Asunder that his first drafts read like Checklists In Space: docking procedures, shiphandling, details basically nobody cares about. Nobody wants to read about that, and certainly nobody wants to play that. Turns out: some of us do want that! Elite gives me the Checklists In Space I want, and therefore feels like being Becca Metadi, Han Solo, or Pham Nuwen. The story isn’t set, but there are enough sandbox pieces that you can put together goals and story. This is the game that persuaded me to buy a Rift. After I put my kids to bed, I can go fly a starship. Last night, I played for just a couple hours. Here’s an example of one night’s play. I’m in Upsilon Aquarii, a star system of no particular significance. But it’s near this other star system that has a damned inconvenient station, Smeaton Orbital. People from Upsilon Aquarii will pay a fortune to get to Smeaton Orbital… but only if they trust you won’t get bored and ditch them half way. So I’m trying to earn enough rep with the factions here in UA that I can start getting passenger contracts to Smeaton. All that’s to afford a fast enough ship to go explore the other side of the galaxy, about 20 million credits. There’s a civil war brewing in this system, so a lot of the missions are about killing this or breaking that. Go figure. I take two missions from the local democratic government to reduce the local pirate population. Each says “go kill 4 pirates.” I slip up reading, and one of them is for the local pirate group, but in the next system over. Oh well. So I head to the system’s entry point, where starships jumping in will land. I don’t want anything with them, but pirates will wait here to pounce… so I’ll wait for the pirates. It takes about an hour for four relevant pirates to drift in, and I take them all out. In the mean time I’ve racked up a dozen or so kills on other pirates, and apparently this system starts to get a reputation for being unhealthy for piracy. Great. I hop next door to the other system I’m supposed to clear out. Hey, first thing I see a relevant icon on my radar. I check it out. It’s three relevant pirates, all together, all flying the biggest, baddest ships in the game. Um. This mission just got Seriously Not Worth It. But… what the hey. I wait for them to warm up their FTL drives, and let two jump out. Then I blast the third… and watch him blink FTL. Oh well, maybe I scratched his paint. I go find some more of these pirates, whack two. Two to go. Hey, here’s a third in a secondhand navy Gunship. Can I take that in my ship? Five minutes later: no, no I cannot. I’m dead. I pay my Pilot’s Federation insurance deductible and am issued a new ship just like the one I lost. And, um, a new life. Let’s not look too closely at how that happens, but it’s a great mechanic as an alternative to starting from roguelike scratch. I fly back out and find the same guy. This time I’ve learned a bit, I fly better, and I almost get him before he cracks the windshield on my ship. My air leaks out, and I have five minutes of air in my helmet. All power to engines, boost away from there, and hit FTL… with no front window, just my helmet between me and whatever’s out there. Best part, that window’s where my HUD is projected. HUD’s where you get the best view of speed and distance to a target. So I’m flying semi-blind, on instruments, to the nearest station, in a terrible rush. I make it with 45 seconds to spare. They fix my shield and sell me a bigger air tank for my next mistake. I find some more pirates, whack them, and collect my bounties. My next mission to curry favor is to check out a mob base on a nearby planet. I survey the planet from low orbit, pick a couple likely looking spots, do some low passes, land at one, drive out in a rover. Hey, it is mob-operated… so there are bounties on the security drones! I whack those, grab everything not nailed down, take it back… wrong mob-operated base. I do it again–different place, different terrain, basically same drone AI. That one’s right, I get paid. Now I own a Vulture heavy combat ship, a Diamondback Explorer fitted for long range, solo, deep space exploration—jumping more than 40ly per hop—and a Type-6 transporter set up as a passenger ship. I’m out on that exploration trip now, near the Trifid Nebula. When I get back, I expect I’ll switch the Type-6 over for collecting rare materials and play with the component engineering system, see if I can get a ship fit for P2P combat.